Would you like the chance to turn back the clock on your casino losses and get 10% of all unsuccessful stakes back? Of course you would! Nobody likes to lose but, unfortunately, we all come across an unlucky streak from time to time. Now, thanks to the Your Play Back offer over at Sky Vegas- you can insure your stakes and earn back a bonus every time you make a loss. Your Play Back allows each player to earn back 10% of their total net losses as bonus bucks. This means that if you wager £200 and only win £100, you will have made a net loss of £100 so Sky Vegas will return £10 to you in the form of bonus funds. Of course, the amount you get back depends on how much you stake and how much you lose. The minimum Play Back amount is £1 and the most you can get is £50. No matter how much Play Back you receive, it will be credited to your Sky Vegas account no later than 7pm on Friday the 17th of February. 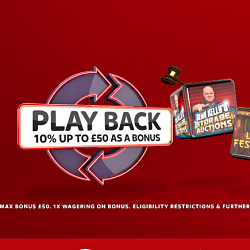 To make sure you get 10% back on all unsuccessful gameplay at Sky Vegas, all you have to do is sign into the site and click ‘Opt In’ on the Your Play Back promotion page. Once you’ve opted in to the offer, 10% of all your net losses will show up in your account by February 17th. This counts for every single game on the casino, apart from Caribbean Stud Poker. The Play Back promotion kicked off on February 13th and will remain active until February 16th. You can opt into the offer at any time during this period and the 10% Play Back will be paid on all stakes dating back to the start of the promotion. During this promotional period, all registered members of Sky Vegas, who Opt In, will be able to earn back 10% of their net losses. That means new and existing customers alike, so there is still time to sign up for the site if you haven’t yet. Only real money is insured by the Play Back promotion.